This garlic hot dog is dedicated to my Dad. Everyone was always excited to hang with him. He also had the same love of junk food as I did. We would go to Yankee Stadium and eat until we could not fit in the chairs. My fave combo was (and is) a hot dog and the famous garlic fries. So cheers to the garlic dog and thank you Dad for the memories! I will continuing eating in your honor. 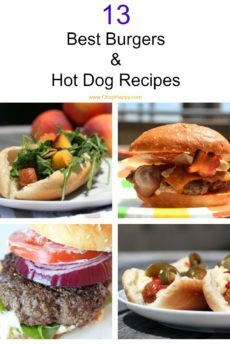 Dress hot dogs and buns with the hot garlic butter, garlic slices, and sprinkle with basil – and enjoy! Now this is a sure fire winner for Filipinos as we love our garlic, in fact if I make mine I will add more garlic on it specially the crispy fried ones. Thank you for awesome comment and love crispy fried onions too!